Each dot represents housing units built before 1940, in the 1940s and 1950s, in the 1960s and 1970s, in the 1980s and 1990s, or since 2000. By analyzing the age of housing stock, we can summarize the story of development and growth in the Indianapolis region. 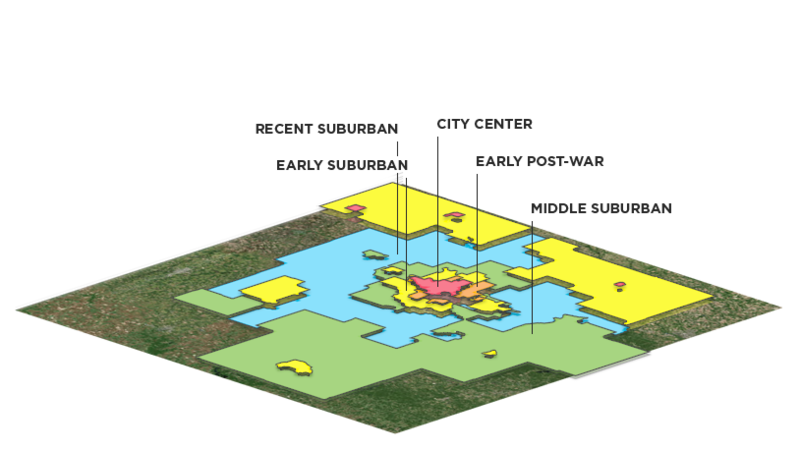 We looked at the predominant period in which each census tract and its neighbors developed, which result in categories or “typologies” of different kinds of urban and suburban rings. 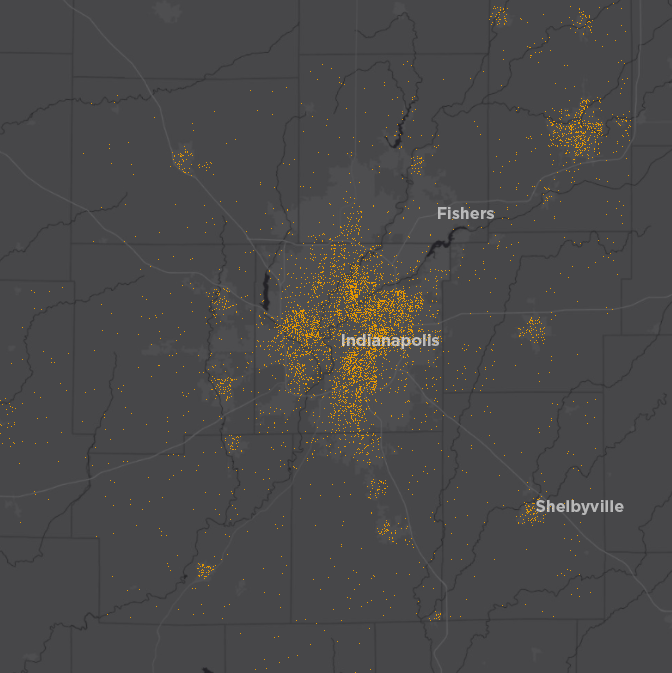 The resulting map is one way to view the history and development of Indianapolis. The American Community Survey estimates there are over 100,000 housing units currently standing that were built before 1940 (2017 five year estimates). Some units built before 1940 have been demolished. The 1940s saw little development, as housing construction was stalled by World War II. By the 1950s, we were building 100,000 units each decade. Construction peaked in the 1990s and 2000s. The period since 2010 has seen less construction because of the recession and because it is a shorter period (2010-2017). The maps above provide a useful perspective, but how can we turn this into a neighborhood-level measure to classify areas by development period? Every tract has a mix of housing built in different time periods. However, if we classify areas based on the most common development period, a clear pattern starts to emerge. For example, the tract that contains the State Fairgrounds had 322 units built before 1940, 550 built in the 1940s and 1950s, and 94 built in other periods. So we will classify this as predominantly built in the 1940s and 1950s. This is a useful framework, but it presents some problems. The the center of Indianapolis and other cities and towns across the region were largely built before 1940 (red areas). But downtown Indianapolis is different, because some of its pre-war housing has been demolished. Newer housing built since 2000 now outnumbers the older housing stock. But it would be wrong to say that downtown Indy primarily developed in since 2000, since it is obviously the oldest part of the city. If we also take into consideration the neighboring census tracts, we can start to develop more regular “bands” of development. 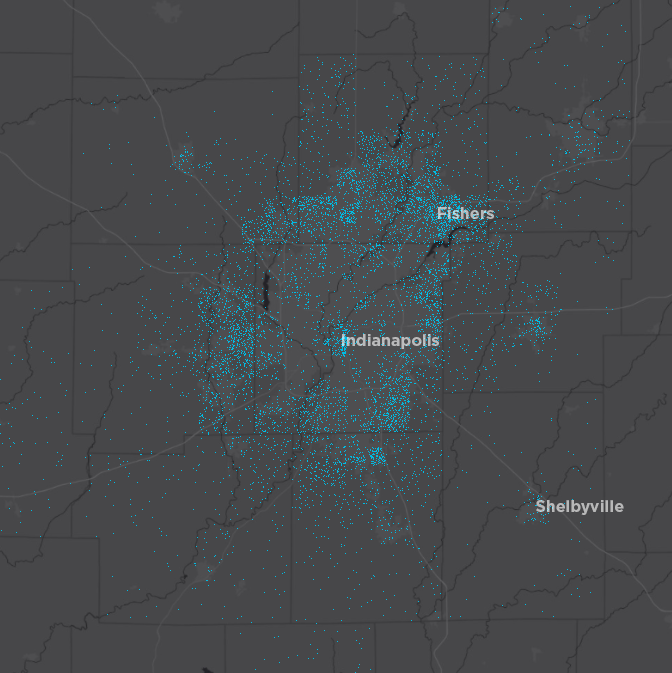 Now, for example, by considering neighboring areas when we classify downtown Indy, we correctly find that the area is part of the old city core. This method has far fewer outliers and “stranded” tracts. The northeast side of Marion County, for example, is clearly split into three development bands instead of the mosaic of primary development periods shown in the previous attempt. The downside of this approach is that outlying city centers are no longer classified as being primarily built before 1940, except in Anderson and Shelbyville. This is because units in newer developments outnumber the pre-war units in the core of many cities and towns across the region. We call these resulting development bands City Center (primarily built before 1940), Early Post-War (1940s and 1950s), Early Suburbs (1960s and 1970s), Middle Suburbs (1980s and 1990s), and Recent Suburbs (2000s and 2010s). Now that we have defined each development band, let’s analyze each. The City Center area makes up the core of Indianapolis, Anderson and Shelbyville. It accounts for 47 square miles, one percent of the regions area, but contains 93,639 housing units, 11 percent of the regions housing supply. The City Center band has a density of 2,005 housing units per square mile. Below is a typical neighborhood in the City Center area. Homes are typically brick or wood siding. If garages are present, they are along an alley. The street network is a grid system with high connectivity (many intersections). Early Post-War areas developed largely in the 1940s and 1950s. These places are half as dense as City Center areas, but much denser than the suburbs that developed after them. This development band is small, making up only 46 square miles and six percent of the housing supply. 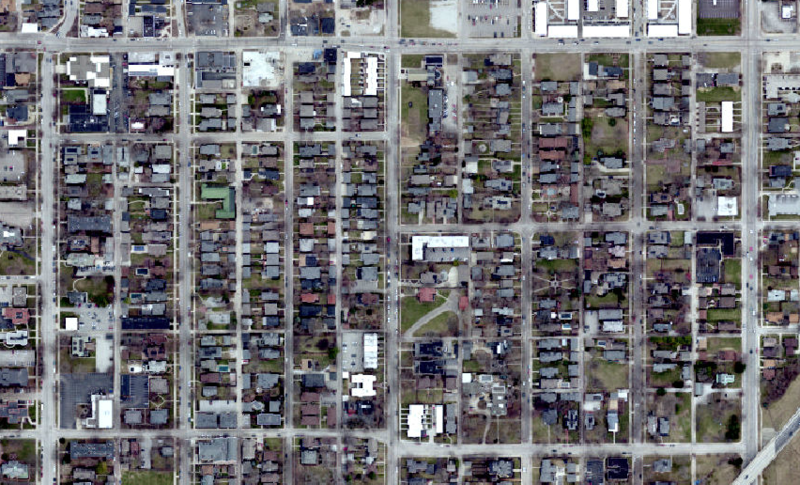 It is typified by places like the neighborhood below, on Indianapolis’ Eastside. The street grid is sometimes obscured and blocks are larger. Driveways are more common and sidewalks less. Houses are ranch style: low, wide, and parallel to the street. Houses and lots are still relatively small and packed in. Exterior materials include brick, limestone, and aluminum siding. The Early Suburbs were developed largely in the 1960s and 1970s. There are 237,000 housing units that fall into these areas. 40 percent of these housing units were built in the 1960s and 1970s. This band makes up 1,060 square miles, or 28 percent of the region. It’s typified by places like Lawrence, pictured below. The street grid is gone. 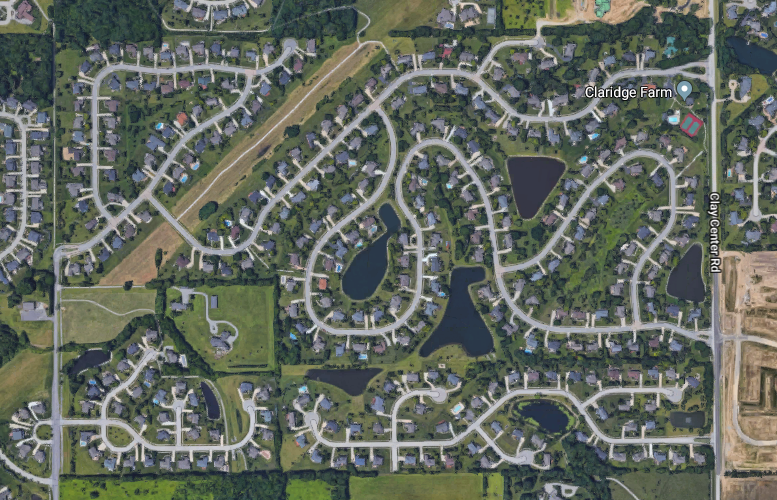 Each subdivision includes a unique street layout that connects to arterial roads in only a few places. 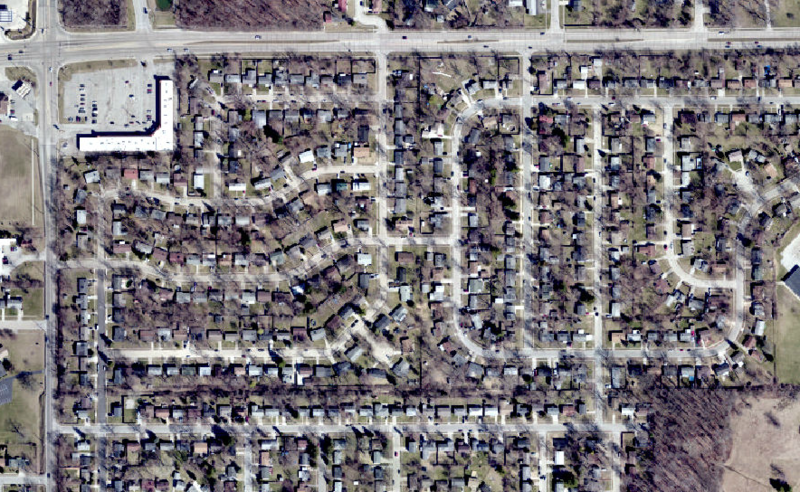 Split-levels and ranches are common, and sidewalks are uncommon. Houses are commonly clad in brick and vinyl. 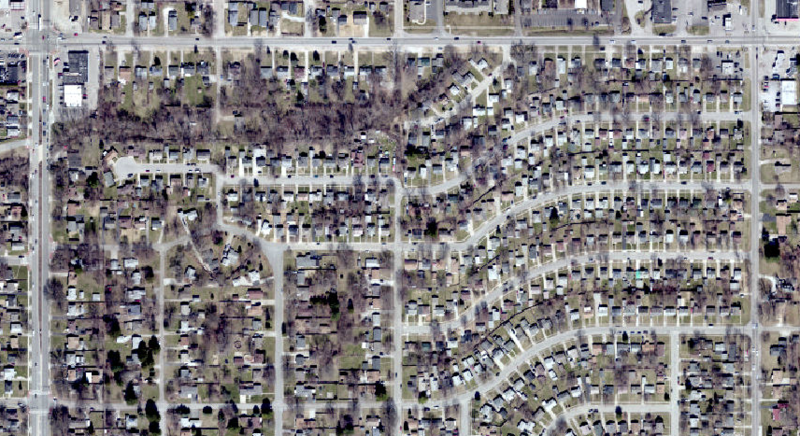 Middle Suburbs developed in the 1980s and 1990s. The density of this band is low, only 119 housing units per square mile, because much of the band covers agricultural and rural areas in outlying counties. In Marion County, this band is typified by places like Castleton, shown below. Lots are often larger and homes are set further back from the street. Brick and vinyl are common exterior materials. Recent Suburbs developed since 2000. It represents one third of the regions land (1,367 square miles) and 29 percent of its housing supply (about 245,000 housing units). This is more housing units than any other development band. 41 percent of these units were built since 2000. It is typified by developments like this one near Carmel. Brick, stone veneer, vinyl, and cement board are common exterior materials. In some areas, sidewalks are more common and may connect to multi-use paths. Again, neighborhood streets connect to the larger street network at a limited number of intersections.